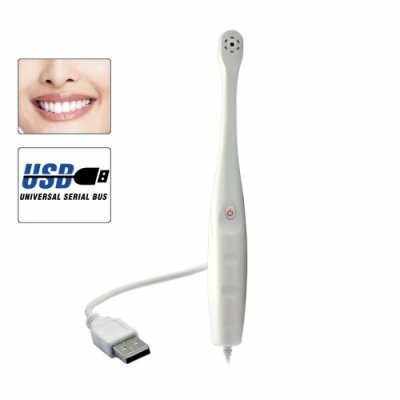 Successfully Added Dental Intra-Oral Camera - Computer USB Connection to your Shopping Cart. Dental Intra-Oral Camera - Computer USB Connection. Wholesale priced dental camera enabling users to examine teeth, or other body parts by themselves or with the help of others, and viewing the pictures live on a computer. A great computer camera gadget for getting a close look at what is going on in your mouth, this device is perfect for dentists, teachers wanting to give lessons, or people looking to make sure that a trip to the dentist is necessary after all. With high resolution of 320x240 pixels, 6 bright LED lights for illumination, and one touch picture taking that can be saved directly to a computers hard drive, this is a easy to use high quality device. This is one of the example of modern tools and equipment uses in dental procedures. Because of these kind of tools, dentist?s work becomes more easy.